Editor's note: You may have found this story via a Web search. 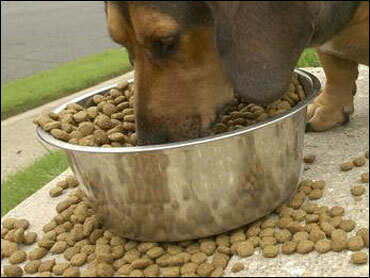 It has correct information for a pet food recall conducted in 2005. The Food and Drug Administration says contaminated dog food that was sold in 23 states has killed almost two dozen dogs nationwide and sickened 18 others. The FDA says some of the recalled product was exported to at least 29 countries including several in the European Union. The FDA says those countries have been notified. The deaths and illnesses sparked an FDA investigation into the pet food made by the Diamond Pet Food Co. at its, manufacturing plant Gaston, South Carolina. The FDA said 23 animal deaths have been linked to the pet food so far. The company, based in Missouri, issued a recall of 19 varieties of dog and cat food on Dec. 21 because some of the pet food made at the Gaston plant was discovered to have contained aflatoxin. Aflatoxin, a naturally occurring chemical that comes from a fungus sometimes found on corn and other crops, can cause severe liver damage. Aflatoxin poisoning can cause sluggishness, lack of appetite and in severe cases heavy vomiting, fever and jaundice. The recalled pet food was sold in 23 states under the brand names Diamond, Country Value and Professional, and bears the date codes of March 1, 2007, through June 11, 2007. The FDA is advising consumers to immediately stop using the product. Ohio, Pennsylvania, Rhode Island, South Carolina, Tennessee, Vermont, Virginia, and West Virginia. Seven dogs from the Rochester, New York, area are being treated for liver disease and failure at the Cornell University Hospital for Animals after eating contaminated food, said university spokeswoman Sabina Lee. An area veterinarian discovered the link after three dogs died in the area, she said. In a Dec. 20 press release, the company said it had notified distributors to stop sales of Diamond pet food that had used corn. The next day it ordered the recall. The company said it is analyzing retained samples of all the affected pet food products in Gaston in an attempt to isolate specific lot numbers and provide the information to distributors, retailers and customers.